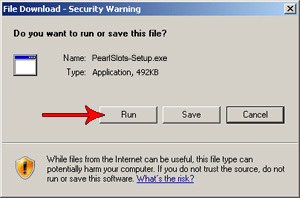 How to Download the Pearl Slots software. 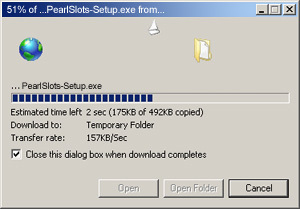 Follow these simple instructions for downloading and installing Pearl Slots on your computer or laptop. Our download procedure is so simple you will be playing the coolest online casino games within a few minutes. Begin by clicking the red Download icon above. Don't worry; you will be downloading a light and secure file to your computer. Once you have Pearl Slots installed you will be able to play anytime from the comfort of your home! After clicking on any of our Download buttons, a pop-up screen will appear on your computer. 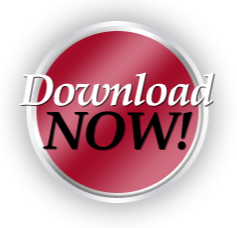 Click on the "run" button to begin the download. Allow only a few short minutes for the download to be completed. The download time depends on your internet connection but will normally download within 5 minutes on a Broadband connection. When the download is completed a new screen will appear asking you to install the software. Simply click on the "Run" button again and allow a few minutes for the software to get installed properly. Should you experience any difficulty during the download or installation process, please contact our Live Chat support for immediate assistance. Click Run to install the software. Once the software has been properly installed you will be asked to read our ?End User License Agreement'. 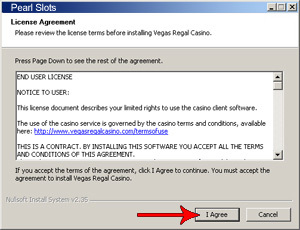 Once you have read the agreement, click on the "I Agree" option. Finalize the installation by clicking on the "Finish" button. 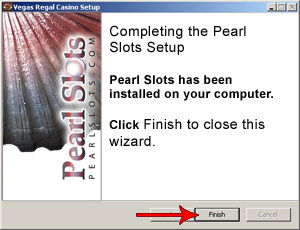 Installation is now complete and you are ready to enjoy all of the Pearl Slots online casino games! Need help with your download, click HERE for instant support.